The last time I probably felt truly terrified at a movie was — well, OK, probably last weekend when I saw Alfonso Cuaron’s GRAVITY. Particularly, his use of silence in space, how you the viewer can only hear what the characters do inside their helmets. Therefore, like those poor astronauts, you cannot hear as millions of chunks of space debris travels hundreds of miles per hour while you can’t do jack squat about it. Prior to that, it’s hard to recall any recent release that’s either made me jump or even worry a little. It’s my own fault. Years of watching horror, thrillers, suspense and general uneasy content has left me kind of numb to their powers. Instead of shielding my eyes or gasping out loud, I can’t help but laugh at anything meant to genuinely scare. It’s not a knock on the scarers — in fact, it’s a compliment. These are supposed to be thrill-rides, right? If they merit any audible response, they’ve done their jobs. But films that manage to pull and real “scares” out of my tend to escape the traditional horror genre. Jump scares only go so far. I need something that makes me think about for hours or days, a sense of dread I can’t and won’t escape soon. Horror, the kind that tends to take itself (too) seriously, hasn’t really accomplished that, with the exception of one or two titles. As Halloween fast approaches, I sit back for my annual horror marathon of so-called classics I’ve yet to see. I just finished Adrian Lyne’s would-be mind-eff JACOB’S LADDER, which was said to have an all-timer twist ending (a prospect I attempted to avoid and forget), and I walked away thinking it was just OK. I’ve got John Landis’ AN AMERICAN WERWOLF IN LONDON, ABBOTT AND COSTELLO MEET FRANKENSTEIN and a handful of movies via Netflix Instant I’m ready to knock out leading up to Oct. 31. Below are my five favorite “horror” films of the last five years. Some fall into the traditional horror genre, while others would be considered suspense, or even straight dramas in some cases. But they achieve what typical horror movies do not. They scare me. They’re unpredictable. I literally have no idea what’s happening or what will happen in these movies as they play. I hope you’ll indulge me. My favorite film of 2011 still holds up after countless repeat viewings on HBO. Some would argue this works more as a disaster movie given the realistic nature and government slant, but how can you look at some of the corpses director Steven Soderbergh and screenwriter Scott Z. Burns, along with their fictional epidemic, leave behind and not toss this one into the horror genre? One particular autopsy of an A-list star and the final image of one of the character’s youngest children who succumbs to the virus — those are disturbing, lasting images that left me breathless in my seat. Not to mention the chaos in the streets when a cure seems unlikely, Matt Damon’s immune father protecting his vulnerable daughter from savages and survivors. In one of his final directorial efforts, Soderbergh took a shot at horror, and as he typically did, he put on a clinic. Sam Raimi doing what Sam Raimi does best, which is making SPIDER-MAN movies. But let’s keep things positive, shall we? Raimi established himself a horror/comedy master with his latter two films in his EVIL DEAD trilogy. Then he disappeared into La-La Land, cranking out so-so studio efforts and Sony’s first SPIDER-MAN mega-trilogy. He finally reached the surface to take a breath and made his first horror flick in years, and the results tell you he needed to get that mug out of his system and how. Alison Lohman stars as a banker who denies a gypsy a loan and must figure out a remedy to rid herself of an awful curse in the wake of her supposed wrongdoing. Earlier I said jump scares tend not to get the job done, but Raimi’s here are brilliant timed and come when you absolutely least expect them. Also, you have a totally original fable with Loony Toon-level action gags, creepy atmosphere and wonderfully disgusting set pieces and makeup designs. It was glad to have Raimi back for a minute. Perhaps most importantly, our intro to Swedish director Tomas Alfredson, as skilled an auteur as any working today (also responsible for 2011’s TINKER, TAILOR, SOLDIER, SPY), this film breathes a way others don’t, allowing for pacing and strong character development. Here you find young bullied Oscar, who finds a companion and perhaps more in the seemingly same-aged Eli, who it turns out has a thirst for more than a new friendship. What stands out about LET THE RIGHT ONE IN is not only that pace and decidedly creepy mood it sets from the opening minutes, but the scale in which Alfredson and his crew shoot it. This rather small story feels larger than it is thanks to brilliant compositions and even lighting. And the finale in the pool is all it’s cracked up to be, too. Watch out, bullies. This one feels like Martin Scorsese doing a Stephen King adaptation. Instead, it’s Marty’s spin on Dennis LeHane’s novel starring Leonardo DiCaprio as a U.S. Marshal on the hunt for an escaped inmate at a hospital for the criminally insane. Stepping way out of his comfort zone, Scorsese establishes a mood even ardent fans cannot claim they expected from the guy who brought us GOODFELLAS and RAGING BULL (though you could make a case for TAXI DRIVER, I suppose). 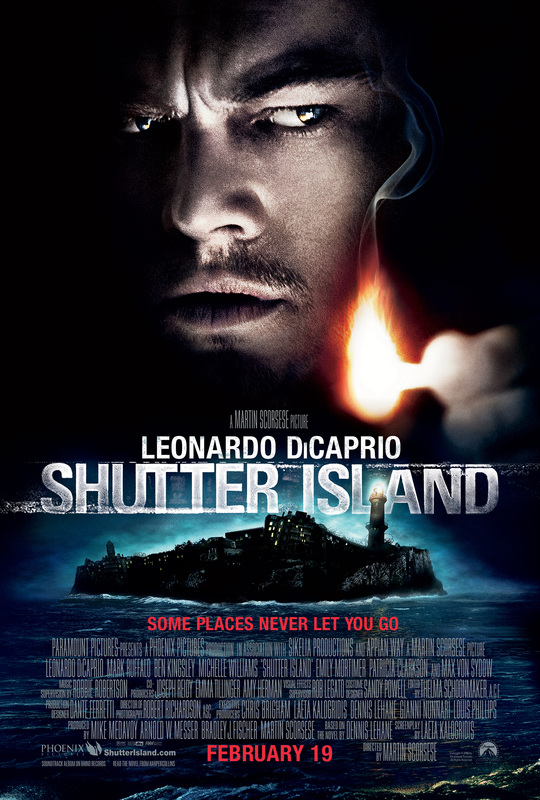 His patented use of music, here mostly frightening classical numbers from the likes of Penderecki and Ligeti, fits right in as things almost immediately begin to go awry as DiCaprio’s war vet Teddy begins to slip while on the job in the least ideal conditions imaginable. His encounters with the inmates and hospital staff (namely Max Von Sydow and Ben Kingsley) make for eerily memorable moments, but his car ride with Ted Levine’s prison warden features a fascinating monologue about violence. Once you’ve seen it and go back for another round, it’s even chillier. With PI, we knew Darren Aronofsky could give the viewer an uneasy feeling, but you simply never relax during this often melodramatic raw nerve of a story involving a meek ballerina (Natalie Portman in an Oscar-winning role) who wins the lead role in Swan Lake and begins to lose her mind obsessing over the perfection required to nail the performance. Portman’s unnerving work along with the director’s handheld camera help to create an unusual sensory experience that won’t even let you bite your nails (see the movie). How Aronofsky creates suspense and dread in the competitive world of New York City ballet is impressive, though I’m sure real participants would tell you it can get pretty scary. The director toys with the audience, testing the boundaries of reality and fantasy as Portman’s poor girl’s obsession spins out of control until the impeccably filmed final performance.